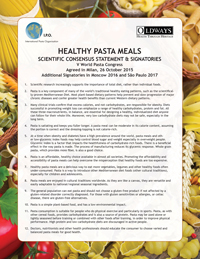 Twenty scientists and health professionals from nine countries met in Milan, Italy in October 2015 to present the latest research on pasta and to craft this 12-point Scientiﬁc Consensus Statement on healthy pasta meals. Scientiﬁc research increasingly supports the importance of total diet, rather than individual foods. Pasta is a key component of many of the world’s traditional healthy eating patterns, such as the scientiﬁcally-proven Mediterranean Diet. Most plant-based dietary patterns help prevent and slow progression of major chronic diseases and confer greater health beneﬁts than current Western dietary patterns. Many clinical trials conﬁrm that excess calories, and not carbohydrates, are responsible for obesity. Diets successful in promoting weight loss can emphasize a range of healthy carbohydrates, protein and fat. All these three macronutrients, in balance, are essential for designing a healthy, individualized diet anyone can follow for their whole life. Moreover, very low carbohydrate diets may not be safe, especially in the long term. Pasta is satiating and keeps you fuller longer. A pasta meal can be moderate in its calorie content, assuming the portion is correct and the dressing-topping is not calorie-rich. At a time when obesity and diabetes have a high prevalence around the world, pasta meals and other low-Glycemic Index foods may help control blood sugar and weight especially in overweight people. Glycemic Index is a factor that impacts the healthfulness of carbohydrate-rich foods. There is a beneﬁcial eﬀect in the way pasta is made. The process of manufacturing reduces its glycemic response. Whole grain pasta, which provides more ﬁber, is also a good choice. Pasta is an aﬀordable, healthy choice available in almost all societies. Promoting the aﬀordability and accessibility of pasta meals can help overcome the misperception that healthy foods are too expensive. Healthy pasta meals are a delicious way to eat more vegetables, legumes and other healthy foods often under-consumed. Pasta is a way to introduce other Mediterranean diet foods (other cultural traditions), especially for children and adolescents. Pasta meals are enjoyed in cultural traditions worldwide. As they are like a canvas, they are versatile and easily adaptable to national/regional seasonal ingredients. The general population can eat pasta and should not choose a gluten-free product if not aﬀected by a gluten-related disorder correctly diagnosed. For those with gluten sensitivities or allergies, or celiac disease, there are gluten-free alternatives. Pasta is a simple plant-based food, and has a low environmental impact. Pasta consumption is suitable for people who do physical exercise and particularly in sports. Pasta, as with other cereal foods, provides carbohydrates and is also a source of protein. Pasta may be used alone or lightly seasoned before training or combined with other foods after training, in order to improve physical performance. High protein and low carbohydrate diets are discouraged in active people. Doctors, nutritionists and other health professionals should educate the consumer to choose varied and balanced pasta meals for good health. View presentations from the 2015 Scientiﬁc Consensus Conference on Healthy Pasta Meals here.